Over 25 years experience of home improvements gives us the skills and knowledge to provide a range of solutions to any home improvement jobs you have. If you are looking to make your house a happier home or if you are needing help with all those odd jobs left unfinished then Handyman Services Glasgow can help you. We offer our customers an unrivalled painting, decorating and plasterwork services throughout Glasgow and the surrounding areas. All improvements work carried out to a guaranteed high level. We offer many different home improvement services. For a full list of our skills on offer see below. Click here to view a slideshow of home improvements work we have previously done, services and solutions offered. All walls and ceilings repaired or skimmed. We specialise in period coving – see our slideshow for example plasterwork. We also remove and vent fireplaces and create archways. All interior house painting work carried out. 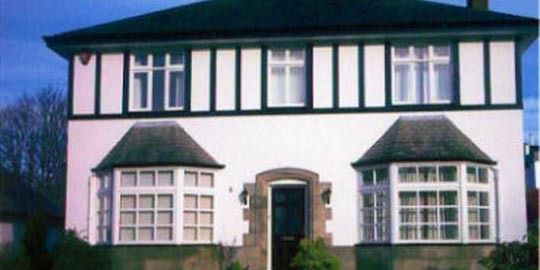 All exterior house painting work carried out. We only use branded paint – Dulux, Crown, Weathershield etc so you can be sure of great results you’ll be delighted with..
Energy saving products can save the environment and save you money. We can insulate lofts, lag pipes and tanks. We will install draught proof products and help reduce your fuel bills.